A while ago I lamented the lack of Filofax art on the Web, versus the vast proliferation of sites where people display art created in their Moleskines. A very nice reader named muse924 responded in a comment with this link http://www.filofax.de/famous/ to the German Filofax site showing the sketched-up 'faxes of Katerina Witt, Paco Rabanne, and other celebrities. So cool I had to pull it to the front so no one would miss it. (Well, at least no one who visits this blog religiously—and I know there are millions of you out there.) Check it out! I haven't been giving much thought to writing instruments lately. But surfing around one sleepless night, I visited Pencil Revolution and started drooling. Wow. Who knew people were so passionate about pencils? I love writing with a pencil, and hated it when I reached 4th grade and slippery ball point ink became a requirement. I went through a fountain pen phase a few years back. At one point, I had four going at a time, with different color ink in each one. Then, when I realized I desired better, more expensive fountain pens but didn't want to spend the $$ on them, I switched to gel pens. The gel runs out quickly, but they're refillable. Recently, I abandoned gel because it does clot and skip sometimes, and I also wanted a finer point. Now I write in my 'faxes with Sanford uni-ball pens, with a "micro" point. They come in a "deluxe" model, with a bronzish body, and another model ("regular" I guess) with a matte black body. You can buy them by the dozen at Staples, and I keep them all over the house. Sometimes I pencil events into my 'fax, if I'm uncertain of their likelihood. Maybe I'll take a note from Pencil Revolution and start rebelling against the tyranny of ink more often! UPDATE: After first writing this entry, I bought some new pencils and a case. You can see more here. I had a hidden agenda in becoming a Philofaxy blogger...hidden from even myself. Accountability. Like many people who've made a transition from digital to analog, from one career or workstyle or lifestyle to another, or taken on any kind of shift that involves a change in organizational system, I'm guilty of endless tinkering and tweaking. As soon as I get all my information, notes, projects, schedules, and plans into one system, said system's flaws become immediately apparent -- and unbearable. So I tinker. I buy more Moleskines, index cards, or Circa refills, thinking I've finally found the answer to it all. I must confess, no sooner had I posted this entry announcing that I had finally transcribed everything into my newly acquired 'faxes, that the itch returned. Once my desire to have everything in one place, on one (OK, two) interchangeable paper sizes was satisfied, all of a sudden it was all wrong. Now that I could carry everything I needed with me all the time, all of a sudden I didn't need or want to. It was cumbersome, burdening. And the perfect configuration -- personal A5, work A5, Pocket as PDA -- was suddenly all wrong. How well was my system working if I was I leaving the house with three -- count 'em, three -- 'faxes in my bag every day? Could I abandon this blog and start over? Those new 18-month 'skine diaries look pretty darn cool. Or what about the minimalist route -- index cards, plain letter-size paper, and manila folders? But no. Accountability. I've finally and fully accomplished a solution that I thought I wanted. Give it time. Figure out what's working and not working. Maybe all I need to change is what's not working. Behind the Notes tab, I started keeping Filofax notes. A few pages later, it became clear that I was overpopulated by one Filofax. So I made the adjustment and kept going. Now I'm noticing something cool. Instead of recopying information, I'm adding to it. For example, behind my Ideas tab, I have a page labeled Blog Ideas, containing some notes on blogs I admire, things I'd like to put on my own blog page, hosting ideas, and today, when I found out about something called Pro Blogger (a blog about making money with a blog), I simply added it to the existing page. An idea that might have gotten lost without being written down at all, or ended up many pages away from related information, is now right where I'll see it when I use it. And I can see my ideas develop over time. Because I have a running book list for more than a year, I can clearly see which ones are going to be worth reading (Warlord, by Ilario Pantano) and which were just a fleeting notion (The Healing Diet, by Gerald Lemole, M.D.). In other words, my Filofaxes are helping develop my thought processes. Or at least, they're not distracting from them. Now that I'm detaching from tinkering, there's more time for the thoughts themselves. I have barely used my Filofax in the past week. It's not for lack of work: Tasks and projects are coming at me fast and heavy. I am sure that a better Filofaxer than Philofaxer would be deploying all Filofax features with stunning effectiveness right now. But I, as a fool befuddled by the chaos surrounding me, have regressed to the planning equivalent of the fetal position: A running tally on a legal pad. I am using a consecutive numbering system on the legal pad, so I have an absolute tally of all the tasks that I have assigned myself. I'm up to about 45, of which probably 38 are complete. I figure that by the end of the whole thing I will have a few hundred items listed, and they will all be crossed off and I will laminate the lists and frame them as a memento of this craziness. Probably not. I am more likely to burn them. Or lose them in the drunken stupor that will envelop me after trial ends. Been a little...quiet around here. It's the time of year when everybody's on vacation. For a couple bizzarro weeks in the environs of where I dwell, you can find parking spaces, go to popular restaurants and get seated in 2 minutes instead of 2 hours. On July 4, I toyed with the idea of photographing my red Filofax with sheets of blue and white paper in some sort of origami arrangement...but I decided to grill some hot dogs and go to bed early instead. I haven't been on vacation, though. 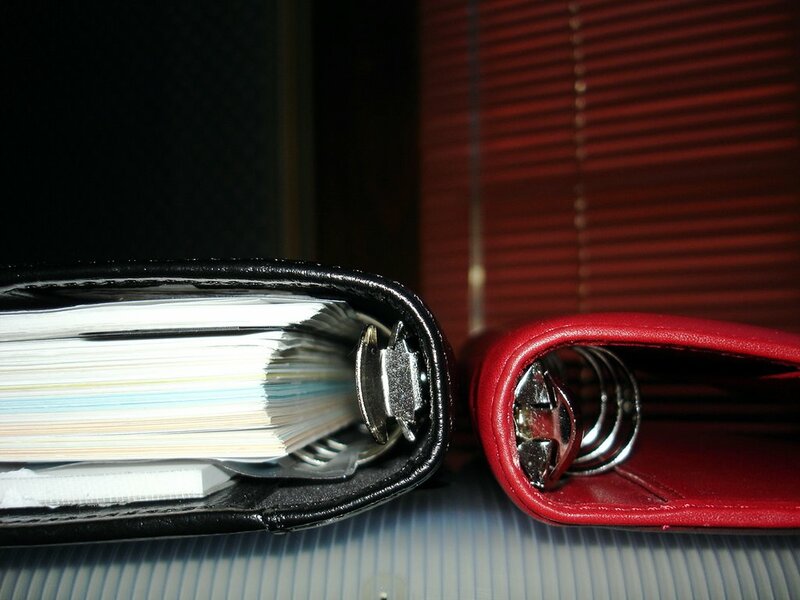 My quietude on this blog has had to do with the relative tranquility of my Filofax life. Yes, there are still some rough spots and tangled knots, but the most important things that need to work are working. I actually cancelled a repair appointment (I'm going to be away tomorrow) w/in 5 minutes of the deadline. Last month, I canceled an online service 5 days before the trial period ended. Not perfect, but not broken either. Somehow, going down from 3 'faxes to 2 removed a whole layer of fidgety static from my life. That's good for my psyche, not so good for my prolificacy as a blogger. Actually, maybe this is a really good sign. With my system finally under some semblance of control, I'm spending a little more time implementing some of the ideas I've been writing down for the past year. I find myself having taken on a new project -- restarting a handbell choir at the church I go to. I'm able to be more present for the people in my life. I'm taking more pictures and actually having time to print and mail them to people. Now that I've abandoned my Palm Pilot, I've introduced myself to my iPod. My next challenge will be sifting. In frantic-capture mode, you frantically capture everything, just as it should be. It's taken a while, but the things I really will do are finally starting to pop up and the nice idea/never happen ones starting to recede. I'm getting the image of certain letters and numbers lighting up, as in "The Da Vinci Code" and "A Beautiful Mind" (a really cheesy cinematic trick, I have to say...but I like it). So, I'm going to be offline for the next 4 days on a little family holiday, making this blog even quieter. But I'll be back, with substantive news instead of static. Yes, I've stopped using one of my three Filofaxes. The handsome, professional looking Black A5 Finsbury. In some ways I like it better than my personal A5 Belgravia...the Finsbury has larger rings and less puffy covers. I'm not a puffy kind of gal. Anyway, I'll tell you what didn't work. I didn't like writing on the day-per-page pages at work. I was writing things that were already tracked in email or Excel (and where I would have no trouble finding them). A few other things were good to write down, but they'd work better in a notebook or a to do list than on a calendar page. And I don't really need a paper calendar at work at all, because I have iCal. On a larger level, I realized the reason I don't need a Filofax at work is because I've come such a long way since the place I was at this time last year. Back then, I was a rock bottom. I had to start from "what information do I need to see and when do I need to see it?" and not being able to answer either question. My work and home lives were both suffering because I had limited myself to whatever fits into a Palm Pilot. The files on my computer were a jumbled mess, all of my email was in one big Inbox where I found what I wanted by searching and never deleted anything because that made me feel I was saving time. Coming up with new ideas, prioritizing a list, or tracking a goal were all beyond the capacity of my buggy software and stressed-out brain. Now, my email and documents are in organized folders with a clear file naming system. My project folder icons are color-coded with iCal calendars. I can do tasks and ticklers either on index cards or in iCal, and both work equally well. When I switched to paper, I just wanted to be using the same format at work or at home, but right now, trying to contort my work matter into a Filo would be fixing what ain't broke. Rather, it might even break something that's working. iCal, Apple Mail, index cards, two letter-size binders for reference materials, a filing cabinet, and a notebook or two have it covered. My work life is also in a steady state, and I'm working mostly on consecutive projects rather than juggling things. I can see how, if I were doing a job search, or if my job description changed drastically, I may well need to use a Filo for it again. So, now you know I don't use a Filofax at work. What's in my A5 personal book? - - Next (for Next Actions), a vestige of GTD. To Do lists by context: Waiting, Calls, Email, Online, Errands, Home, Paperwork, Shopping, and Travel. The order of the pages roughly represents the order of urgency. If, say, online orders became temporarily more urgent than calls, I'd move that page forward to keep it in my face. - - Checklists: 2006 Resolutions, Prototype Weekly and Daily routines. - - Projects: My favorite section. One page per project, and I love Filofax's preprinted Project Planner pages. Just enough guidance without being obtrusive. I need my own handwriting to be the most prominent text on a page. 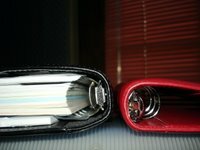 - - Lists: Alphabetical pages listing books to buy, clothes and where to get them, Filofax wish list, movies to see, someday/maybe do list, and so on. - - Ideas: Another favorite section. I use blue paper in this one. Blog ideas, car ideas, computer ideas, charity ideas, financial/investment ideas, home remodel ideas, businesses and careers to pursue someday ideas, gift ideas, family/party ideas and so on, each subject on its own page, ordered alphabetically. These pages have consolidated and categorized all the stuff captured on index cards and other various and sundry places over the past year. - A - Z tabs: In addition to address pages, I keep source lists (all places to buy Filos on a page behind "EF"), and agendas (lists of things to discuss with people, on salmon paper, filed by the person's initial). Oh, and in the back I have a credit card holder that I use to hold jot pads and Post-its, and a pad of plain white paper in the rear of the book.